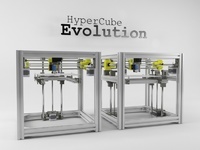 HyperCube Evolution by SCOTT_3D is licensed under the Creative Commons - Attribution license. 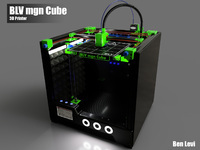 The HyperCube Evolution 3D Printer is a CoreXY printer inspired by the excellent HyperCube 3D Printer developed by Tech2C. The belt arrangement on that printer was the neatest CoreXY arrangement that I have seen. I have leveraged the great work that Tech2C has done to refine his design and incorporated this with my own further development to reduce the number of printed parts and simplify the build. Increase the stiffness of the printer to further improve / reduce vibration artefacts. 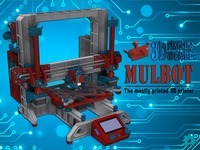 Minimise the size of the printer for the chosen build volume. The prototype printer, with a build volume of 300 x 300 x 300, met with all expectation but did show some small bed vibrations when printing at high speed due to the large bed and counter levered design. Therefore, two build options are available. A single Z axis version for smaller build platforms and a double Z axis version for larger beds or those wishing for a rock solid build platform. The Evolution also features a quick attach X carriage to allow for interchangeable tools e.g. the extruder mount and a DTI mount for tramming the build platform. More to come over the next few weeks as I'm awaiting parts for upgrade the prototype to use the double Z axis, and also the parts to convert my Geetech Prusa i3 into another HyperCube Evolution. 23.04.2017 Added 4 variations of Y carriage to suit different combinations of 8mm and 10mm rails. Plus bearing clamps to suit. Note - current X carriage only suits LM8UU bearings. 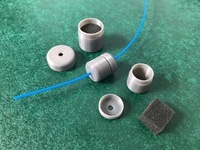 An adaptor will be needed to use 10mm bushings. 30.04.2017 Error found in spreadsheet which resulted in 10mm rails being 30mm too long. Version 1.2 uploaded. 09.05.2017 Version 1.1 Z Axis Linear Rail Bracket - Double Z - Left & Right. 17.06.2017 v1.1 versions of XY Stepper Mount and Idler Mount added which have slotted screw holes for different L brackets. v1.0 versions remain for those who don't need the slot. 18.06.2017 v1.4 configuration file added.. Thanks to Nicolas Harscoat for adding the shaft selector which then determines the part versions to be printed. 01.07.2017 CAD files uploaded for v1.0 as a pack and go. So the assembly should work. Note that some published parts are now v1.0+, but these files should get people going. Frame and linear guides – use the Excel spreadsheet to calculate the lengths required for your custom size. 1 x RAMPS 1.4 with stepper drivers and display – NOTE: This board needs to be modified to run a 24V system. If you don’t then you will kill the Arduino Mega! Say thanks by giving SCOTT_3D a tip and help them continue to share amazing Things with the Thingiverse community. Say thanks and help SCOTT_3D continue to share amazing Things with the Thingiverse community. You'll need a PayPal account to tip SCOTT_3D. Click the button below and you will be redirected to PayPal. Once the payment is complete, you'll be brought back to Thingiverse.